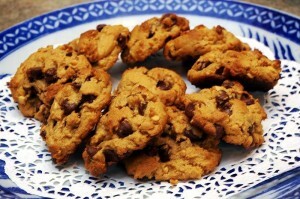 Recipe: Flourless Peanut Butter Cookies – Yum! One of the challenges at Brewster House, like most bed and breakfasts, is coming up with recipes that are good enough to use, but also meet special dietary requirements of some guests. We often seem to have guests who have restrictions on wheat flours or are otherwise gluten-free, so afternoon snacks of cookies, cakes, etc., can be a bit of a challenge. That’s why we were thrilled when, a few years ago, Ruth came across this recipe for flourless peanut butter cookies with chocolate chips in Southern Living magazine. Scott loves peanut butter, and combined with chocolate it is ideal! This recipe has become his favorite of any peanut butter cookie, with or without flour! 3. Bake at 350 F for 12 minutes or until puffed and golden (Cookies will be soft in the center). cool on baking sheet 5 minutes, remove to wire rack.